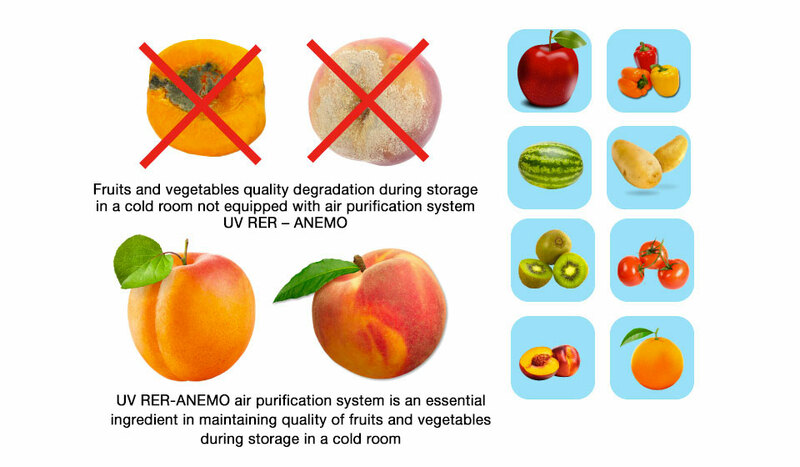 The air disinfection systems UV RER-ANEMO are designed to address the post-harvest storage challenges and to improve the quality of fruits and vegetables. 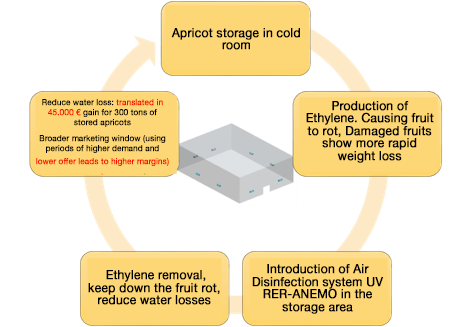 The use of air purification solution UV RER – ANEMO enhance income of producers rather than change farming system practices by limiting the product losses linked to airborne bacteria, virus or molds contamination, by increasing the product shelf life and by restricting the use of polluting chemicals. - Micro – organisms like bacteria, viruses, fungus, spores: easily diffused via ventilation or via air movements causing the volatile fractions to rise and to generate airborne contamination by germs from rotten fruits and vegetables to the healthy ones. - Presence of ethylene: This gas naturally emitted by the fruits speeds up their ripening. The increase in ethylene concentration leads to an increase in the fruit’s respiration (causing a “respiratory crisis” that stimulates its own formation resulting in a loss of fruit water). These two types of air pollution (micro-organisms and ethylene), whose development is closely linked, degrade the quality of the fruits and vegetables, restrict their placing on the market and therefore reduce the consumption and production income. In both cases and aiming to successfully address the air pollution, UV RER – ANEMO to develop an advanced Tri-Active technology: Filtration + Photocatalysis + UVC. Their standalone air purification systems are the result of extensive research and development initiatives and backed by more than 30 years of experience in UVC technology. How to treat your water and eliminate Pseudomonas in farmhouse cheese production? Arboricultural producer, how can you make more benefits with UVRER ?